Improve the quality of life of your pet. Physical problems can occur either after surgery or during your pet's lifetime. To speed recovery and improve quality of life, physical rehabilitation proposes concrete solutions that are tailored to your pet's needs. The department is managed by Claudia Adonna, animal health technician. 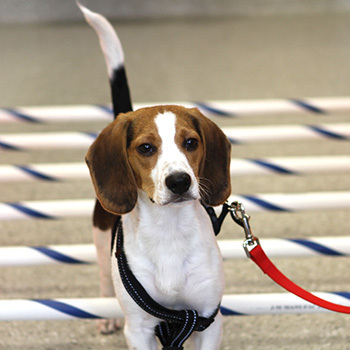 Both are trained and certified in animal rehabilitation (CCRP - University of Tenessee and the CCRA - Canine Rehabilitation Institute, Florida). Offers an overall approach to pet in relation to pet owner. The underwater treadmill offers the combined benefits of water and controlled exercise. The animal's partial immersion reduces weight-bearing stress on the joints and helps to improve walking. 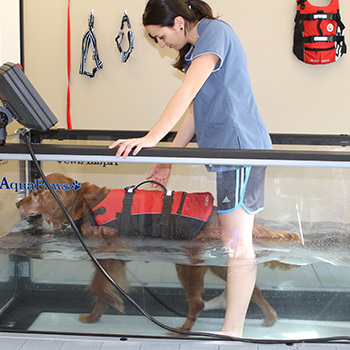 The water jet system allows your pet to make greater effort or swim in complete safety.